If you see my snapchat earlier today, you know that I went to have lunch in this newly opened brunch place called Punchbowl Canteen in Port Melbourne. Port Melbourne has been in my food radar lately. They definitely have some of the yummiest and hippest brunch place in Melbourne. To get to Punchbowl, I recommend driving here because it's located in the industrial area. But there's also bus service near the place so it won't be much trouble to reach it. I rarely have a bad brunch in Melbourne, but there's only a few cafes I feel worth raving about. Is Punchbowl one of them? Yep. Absolutely. It's so easy to love because it's just so lighthearted and fun. It's a classic Australian brunch place where people just want to enjoy sunny day, have a good talk with good company and drink fancy coffee. And don't make me start talking about the foods! I wish I could take you all with me to try them. I must say it's pretty darn delicious, especially the Pumpkin Doughnut, Baked Semolina Gnocchi and Porridge Three Ways (the goldilocks dilemma). I can't get enough of the porridge with tapioca, fresh lime zest, peanuts, and coconut milk. Simply the best. But go ahead to try the others, and don't be scared if you can't decide because it's quite hard to be disappointed with the food here. In the meantime, enjoy the photos! Sydney is really a great city, and it's very different with Melbourne. While Melbourne is more well known for its coffee tradition and hipster culture, Sydney is beachy, trendy, and synonymous to chic. The city has so many fascinating architecture projects, great museums and art galleries, plus, finding good food here requires zero effort. The suburbs are promising and they have islands that can be reached shortly with ferry. The drawback is the size itself. When you are travelling in Sydney with public transportation like the bus, metro or train, it can get a little bit frustrating. Going everywhere is far and you have to race with time when you are travelling, so make sure you manage your time well. Ok so I will try to help you narrow down your choices if you ever want to ask me "What's the must go places in Sydney?" It is not an itinerary though, but it'll help you to plan yours. There we go! The most Sydney experience you can get in a short time. 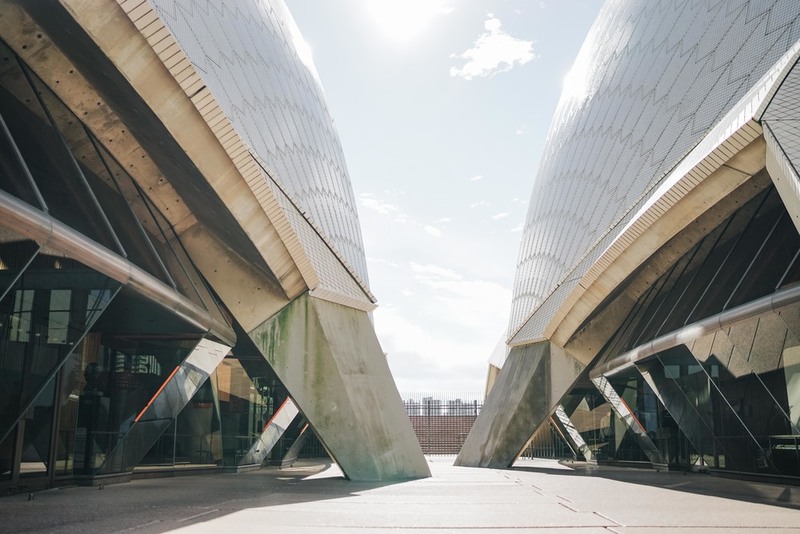 From here you can go to the Museum of Contemporary art in no time, take ferry to Manly, go to Royal Botanic Garden, or climb Sydney's Harbour Bridge. Do more than just taking photo in front of this icon. Go inside the building and take a tour to know the great human behind the design of SOH, Jon Utzon. Eat or have some tea in the the Sidewalk Cafe. Go to one of the opera events. The history of SOH and Utzon is a tragic story. It's definitely worth knowing. Don't wanna be mainstream? Probably see this building by Frank Gehry in The Goods Line, a must go if you are an archi nerd. The Goods Line itself can be quite fun. It connects Ultimo (China Town) and Darling Harbour by walking and cycling. Eat ribs Hurricane's Grill in Darling Harbour or Cream Puff in China Town later. The world's most instagramed cake, they said. Try something else than just the watermelon cake! I gave the salted caramel panna cotta a try and it's glorious. A really cool place for contemporary art lover. G o h e r e.
Skateboarder utopia, eternal sunshine, and the famous bondi iceberg. Call yourself lucky if you can immerse yourself in Bondi lifestyle, even for just a day. Previously called Lowenbrau Keller. I always visit this restaurant each time I come to Sydney. Must try the Pork Knuckle and the apple strudle. I just find out last week that they are open in Melbourne now! I must say I'm not disappointed with their recent rebranding and renovation because the place is now feels more modern and trendy, but the much loved Bavarian style is still there and going strong. Their fun musicians always liven up the night and pull some drinking games for the customers. It's very authentic and I haven't find such experience anywhere else in Aussie. Going to Sydney with family can be a real challenge.. especially because my family always opt Chinese food over Australian brunch. After a lot of disagreement over restaurant selection.. I kinda give up trying to take them to places because they simply not into it. So, this time I decided to separate from the bunch with one of my sister to finally, FINALLY try this famous brunch place. They seriously miss out because this place is so much more than just a cafe. It is a charming combination of cafe, bakery, garden, and urban farm. It transform the old factory into a rustic wonderland. You just have to come here, even if you don't like brunch!! I feel like a little Disney princess again in this place. Inside of the Grounds, bakery carts and small cafes are sprawling just like in a farmer's market. Living up to its urban farm concept, there are a vegetable garden, rustic flower shop, and animal shed complete with chicks and its pig mascot Kevin the Bacon. The newest addition to The Grounds is The Potting Shed, located in front of the fountain. It looks more secretive behind the hanging plant pots, which makes it a great choice for private party/ dining events. I make an amateur mistake to arrive quite late, around noon and it's unsurprisingly crowded. It's like a house party full of children and couples! I suggest you to come early so you can take as long as you want to pose in one spot. I have to wait for an hour to get a table, but it's not a problem because we can wander in the gardens first. Although I'm annoyed with this crazy crowd (taking photo without people in the background become extremely hard! ), everybody seems to have their happy ever after here. They understand really well what people like. And boy, they know that a lot of their visitors are photo junkie like me, cause they install an automatic photo printer that prints you photo once you upload it to instagram with their hashtag #groundsgram. I order a Bonsoy Cappucino, Chef's Breakkie Pan and South Australian's Smoked Salmon. The menu is humble and hearty, you will definitely won't leave hungry. Although it's delicious, if you are looking for a more unique food selection, The Grounds is not my first choice. However, as I said, the atmosphere is very pleasant and it make the food tastes better! City hustle can be exhausting sometimes, and I'm so lucky that Melbourne provides a quick escape that I can reach without getting out of town. In Tuesday, Collingwood children's farm look so different than weekends. I only met several small families or single goers, and the road is surprisingly empty. The brunch place offered humble countryside menu; we order the sweet and sticky banana bread with pecan, mushroom pie, and farmer's breakfast. The jam scone that made up 90% of my decision to come here is totally gone, though! Fitzroy has definitely become one of my favourites since today. This is not my first time, but I've never realised how exciting it is. Along the way, me and Cici can't help to stop so often and take tons of photos, because the houses, walls, graffiti, and all the little things of Fitzroy can never get us bored. Among the many chic cafe in Fitz, we decided to try Industry Beans, because it won an impressive Australia's Best Cafe and Restaurant Design Award last year. It is quite crowded when we come, but the overall atmosphere is very laid back. Around Rose Street there is few other brunch spot such as Breakfast Thieves (which I tried just the day before) and Young Blood (There is Rose St Market there every Sat and Sun). For the foods, I enjoy the Say ABCD and The Legend of Breakfast Thieves more than Industry Beans' Wild Mushroom and Avocado Mash. But, Industry Beans definitely won my heart by the amazing attention they have to the details (oh I luurve their teapot and salt+pepper shakers), the perfect service, and their amazing selection of single origin coffee.